The VA C-File is the most important document in your VA appeal. Do you have a copy of your VA Claims File (aka, VA C-File)? If not, then you have just figured out 1 of the major reasons that the VA keeps screwing up your claim. My eBook (How to get your VA C-File) is the most requested eBook on our site. Over the years, I taught several DOZEN Veterans Advocates the same unique VA C-File requesting process I teach on the Veterans Law Blog. What makes this process unique? Simple: it has teeth. If the VA doesn’t get your C-File to you within the time required by law, I show you how you can file suit in Federal District Court. As far as I know, I am the 1st attorney in the US to advocate using this method of getting C-Files from the VA. Though the law that allows for this C-File Request process has been around since the mid 1970s, not many Veterans have known about it because attorneys have only recently (2007) been allowed to start representing Veterans before the VA Regional Offices. You think a VSO is going to tell you about this method? Puh-leeze. Show me a VSO that routinely teaches every Veteran to request and study their own C-File, and I will publicly apologize to that VSO on video on this blog. (I love being wrong about things like this, because it means MORE Veterans are getting MORE help from MORE people). 1. This is the only place that you might find your C&P results. Here are some reasons that I think that the VA C-File is the most important document in your VA Appeal. Remember that Compensation and Pension Exam you took at the VA Medical Center? The results – and the form requesting it – are in your C-File. In fact, if the VA is denying your claim because of a lack of “nexus” between your condition and military service, there is a really good chance that there is an adverse C&P Exam in your C-File. I have only seen the C&P Exam reports in actual medical treatment records (where they might do some good in treating a Veteran) about 1 out of 1,000 requests. The C-File is probably the only place you’ll find your C&P Exam Results. 2. The VA decision is based entirely on what is in – or not in – this file. 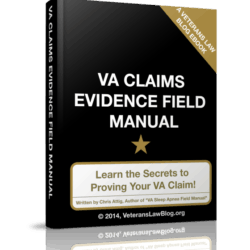 Every level of the claim process looks at the VA C-File. Every level of the claim process reviews it. The DRO will carry it into your DRO Hearing or Conference. Medical examiners have to certify that they reviewed it or their decision lacks legal credibility. 3. Without it, the VBA doesn’t know anything about you. Conclusion 2: You never filed a claim. I’ve also seen the VA deny claims because they cannot find the C-File, or parts of it. They conclude that the absence of evidence is evidence against the claim: one of the most common errors that the VA and the BVA makes. 4. Everything the VBA thinks they know about you is in it.This is very closely related to #3, above. If the BVA or VBA is issuing a decision that is adverse to you, it is because of what is in – or not in – the VA C-File. Ever heard of a Code Sheet? I bet you haven’t. Every time the VA issues a Ratings Decision, they should attach a Code Sheet. This Code Sheet tells me – the Veterans advocate – the claims that have and have not been service-connected, the Effective Dates, the Impairment Ratings, the method of service connection, the Diagnostic Codes used, and so much more. The VA used to attach Code Sheets to the last page of the Ratings Decision, but in their efforts to streamline the claims process, they’ve decided that the Veteran doesn’t “need to know” this information. Its one of the first documents I look for in a VA C-File because it tells me SO much about the case. Do you have your VA C-File? If not …. why not? You have to sue under FOIA or the requests have no teeth. My firm has sued them multiple times under FOIA, and we have never suffered negative consequences because of that. That said, email me at support@veteranslawblog.org and I may be able to get you info that can get it to you quicker. Remind of the facts you shared above in this post. How and where do I get this “C file”? 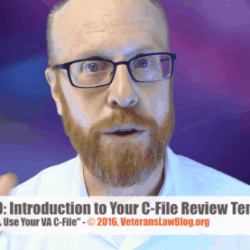 I tell you how in my eBook the C-File Field Manual (How to Get a Copy of your VA C-File). Your volunteer work sounds very rewarding. I’m glad this site is helping. As for representation, you’ll have to request a consultation using the links on the page. Obtained my C-File found a document,not sure of the VA form#, but it was a on exit document from the Marine Corps review board that looks like they clearly got the diagnosis of my congenital condition correct,assigned the initial 10% rating on exit and indicated at least 3X pre-existed but was “aggravated by military service”,injury ocurred while entitled to basic pay,injury did not ocurr in a UA status,injury did not ocurr on my own time. They actually have stuff “x’d ” out and have the word “aggravated” typed in its place? I’m confused. Isn’t this the smoking gun that should service connect my congenital condition that was aggravated by military service. I have spondylolisthesis, no previous history of back probs, 12 wks MC boot camp, 4 PFT’s maintained 1st class ranking(225)heard ‘pop’ in my back helping power plant remove jet engine from F4 on a dolly after being directed to assist from shop NCOIC GSGT. The form is dated Sept 1980 I was discharged(honorable)Oct 1980. Jim – I would be happy to take a look at that document and see if I can make heads-or-tails of it. I’ve seen stuff similar to that before, but not exactly as you’re describing. Anyway, email it to me at chris at attiglawfirm dot com as a PDF attachment if you can, and I’ll give you my 2 cents. (unless you are already represented by an attorney, and then I recommend you go to them, first).